Fury and confusion. Sonny Liston was a very simple man, intellectually limited, and this drove him crazy. He was a great and powerful fighter. He thought he would have no trouble with this guy who fought like Sugar Ray Robinson. He danced around the ring, which, you know, was a bit fey for a heavyweight, after all. And Cassius Clay, who was fearful of Sonny Liston in his heart because he knew how powerful he was – he had seen what he had done to Floyd Patterson – wanted to find a way to get to his mind, to unnerve him. To scare him. To make him second-guess. To think really, that he was crazy because the one thing that Sonny Liston couldn’t deal with was somebody who was nuts. Always in prison – where Sonny Liston had spent some time – the person you never dealt with, the person you always avoided was the crazy man. That’s what you avoided. And so – and Cassius Clay knew that. I’m calling him Clay now, because that’s who he was at the time. And Clay did things like, you know, drive his bus to Sonny Liston’s house in the middle of the night, at 3 o’clock in the morning, run up to the door, and start pounding on the door screaming and yelling and acting like an insane person. And Sonny Liston would come out on the lawn in his shorty bathrobe not knowing what to make of this guy. And it really unnerved him. And Clay and then Ali did it over and over and over again. And the one thing Sonny Liston couldn’t deal with was a madman. But for Clay, of course, it was all by design. And the most famous instance of it was the weigh-in before the first fight. The weigh-in, Cassius Clay comes in and starts screaming and yelling. Usually these are routine performances in which you really don’t do anything other than get weighed and flex your muscles and get the hell out of there. He’s screaming and yelling – I’m going to destroy him – and he’s jumping at Liston. It was the most amazing performance, and Sonny Liston went into that ring thinking he was dealing with a nut. After reading that I’m less sure about Mayweather walking it. 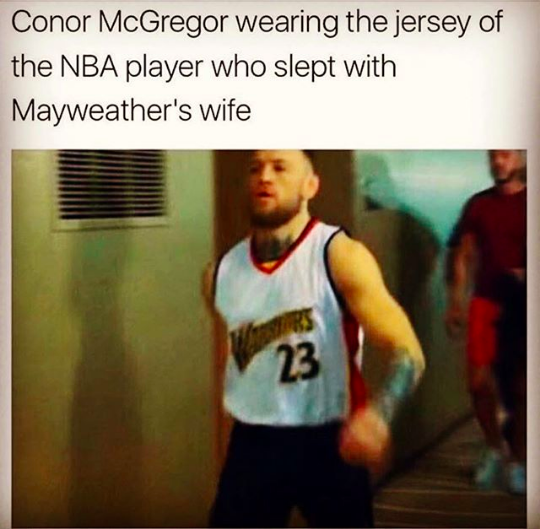 McGregor’s got chutzpah. It might just carry him through.